Sometimes God disrupt our activities. Man-made programs lined up for the day. He disrupt them in order to reveal his glory. He manifests His Glory in our weaknesses, not in our human strength. But often times, we dislike these kinds of disruptions. We went to a meeting, and someone started bringing up some less related issues. But, in essence, it brings out the and glory and praises of God. Shouldn't we let it continue on? How about disruptions in the programs of our lives? The little children in this case are little disruptions. Little children shouldn't be here. That was an adult meeting. No place for children. But not so with Jesus! 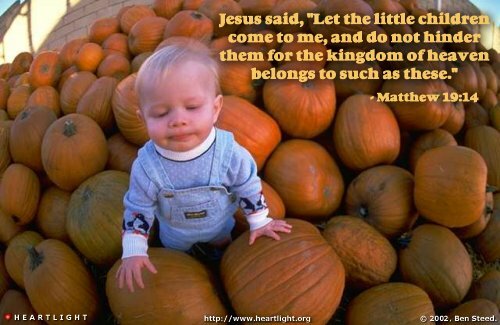 Jesus wanted this children to come to Him with the simplicity of faith. Similarly when the sinful woman tried to break the alabaster flask of oil and wash and anoint Jesus' feet, the disciples interrupted. We have protocols. We have our own sets of rules and regulations. We have our own standard-operating-procedures (SOP). But Jesus disrupted all these. Furthermore, for a woman of her societal stature to come forward in a front of a group of men and did what she had done, it was really something done out of the ordinary. Out of the culture. Furthermore, the aromatic nard oil is extracted from an Indian or Arabian root, and the sale of such costly oil would have yielded more than 300 days' wages of a laborer. An extravagant act of worship. And behold, a woman in the city who was a sinner, when she knew that Jesus sat at the table in the Pharisee's house, brought an alabaster flask of fragrant oil, and stood at His feet behind Him weeping; and she began to wash His feet with her tears, and wiped them with the hair of her head; and she kissed His feet and anointed them with the fragrant oil. And Jesus answered and said to him, "Simon, I have something to say to you." So he said, "Teacher, say it." "There was a certain creditor who had two debtors. One owed five hundred denarii, and the other fifty. And when they had nothing with which to repay, he freely forgave them both. Tell Me, therefore, which of them will love him more?" Simon answered and said, "I suppose the one whom he forgave more." And He said to him, "You have rightly judged." Then He turned to the woman and said to Simon, "Do you see this woman? I entered your house; you gave Me no water for My feet, but she has washed My feet with her tears and wiped them with the hair of her head. You gave Me no kiss, but this woman has not ceased to kiss My feet since the time I came in. You did not anoint My head with oil, but this woman has anointed My feet with fragrant oil. Then He said to her, "Your sins are forgiven." And those who sat at the table with Him began to say to themselves, "Who is this who even forgives sins?" Then He said to the woman, "Your faith has saved you. Go in peace." But Jesus allowed it. Divine surprises. A manifested G0d's glory. Out of the box. Unexpected. The human protocols been broken. Did you put God in a box? Watch the following sermon by Max Lucado titled "Jesus" Bigger Than Your Box"
Jesus, Bigger Than Your Box - Max Lucado from UpWords Ministries on Vimeo.